This collection contains three volumes of the Sydney Directory, covering the years 1847-1913. They're a great genealogy tool for anyone searching their family history or building a family tree. Low's Directory of Sydney 1847, contains a host of information for anyone wishing to know about the people and society of Sydney as it was in 1847. City of Sydney Directory - lists residents alphabetically by surname, together with occupation and street address. District of Sydney Directory - lists residents alphabetically by surname, together with occupation and street address, usually with suburb. Classification of Trades - lists trades alphabetically, together with each persons name under their trade. Sydney, markets and rules for market stall-holders. Chronology of Remarkable Events - starting at 1770 when the coast was first discovered by Captain Cook, and continues through until 1846. It contains details of arrivals of ships and prominent individuals, natural disasters, when churches were built, court cases, appointments, public meetings, the 22 foot snake, when the Sydney Morning Herald began publishing ... and thousands more anecdotes. This makes for an interesting read just in itself. Adverts - the last 50+ pages are filled with adverts of local businesses, which are great for learning more about the society of the time. John Sands formed several partnerships in Sydney and Melbourne. One was with his brother-in-law Thomas Kenny, and together they produced an number of Sydney Directories. 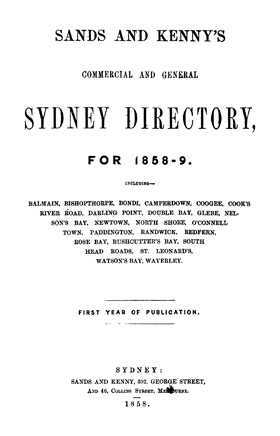 1858-1859 was the first year publication for the Sydney Directory by Sands and Kenny. This commercial and general directory is divided into various sections: Street directory, Suburban directory, General Alphabetical directory, Trades and Professional directory, Official, Legal, Clerical and Collegiate directory, Medical directory and more. A directory can not only give you the name, street address and occupation of a person, but you can find out more about the place in which they lived, their neighbours, the local stores of the time, what goods and services cost in that era. You can find out details of the local churches, clubs and societies. Where the local banks were and who were the doctors in the area. This directory covers Sydney and the suburbs of Balmain, Bishopsthorpe, Bondi, Camperdown, Coogee, Cook's River Road, Darling Point, Double Bay, Glebe, Nelson's Bay, Newtown, North Shore, O'Connell Town, Paddington, Randwick, Redfern, Rose Bay, Rushcutter's Bay, South Head Roads, St Leonard's, Watson's Bay and Waverley. This 1863 Sands' Commercial and General Sydney Directory contains 13 directories in one. This will be a useful reference for all with connections to the region at this time. Major suburbs of Sydney that are included are Balmain, Bishopsthorpe, Bondi, Camperdown, Coogee, Cook's River Road, Darling Point, Double Bay, Enmore, Glebe, Kingston, Manly, Marrickville, Newtown, North Shore, Paddington, Petersham, Randwick, Redfern, Rose Bay, Ruchcutters' Bay, Shepher's Paddocks, South Head Roads, Stanmore, Waterloo, Waverley and Woollahra. 1865 was the fifth year of release for the Sand's Sydney Directory". Similar in style to earlier years, this one contains 13 directories in one. Covering both Sydney and its suburbs, this will be a useful reference for all with connections to the region at this time. Also included is a small Almanac section which lists 'Remarkable Events' for every day of the year. Hundreds of advertisements are also included, which make for interested reading in themselves! The full title is "Sands Sydney and Suburban Directory for 1875 containing street, alphabetical, trade and professional directory together with a miscellaneous directory of useful information". The directory also includes many pages of advertisements, which are all useful information, often including names of people and places. Directories are a valuable resource for local, family and social historians as well as for researchers in other fields of Australian history. This Sands Sydney directory contains towns, alphabetical, trade and miscellaneous sections which lists the names, addresses and professions of most people in Sydney in 1902. It also includes a street guide for some of the major towns and separate directories on education, ecclesiastical, government and European manufactures. Directories are an extremely useful tool for establishing when and where a person lived, however this is just a starting point, look further in the directory to find out more information about the society in which they lived, the occupation they held and the people they knew. The 1913 directory of Sydney is fully titled 'Sands Sydney, Suburban and Country Directory for 1913 comprising, amongst other information, street, alphabetical, trade and professional, country towns, country alphabetical, pastoral, educational, governmental, parliamentary, law and miscellaneous lists.' The directory also includes several indexes to different sections, other lists as well as many pages of advertisements, all useful information, often including names of people and places. Being fully searchable and well set out, this directory is easy to navigate making it a useful resource for family historians.